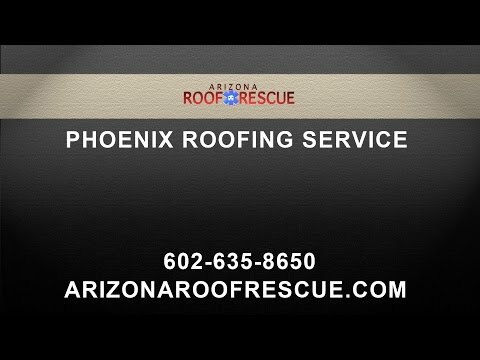 Arizona Roof Rescue is a family owned and operated business with more than twenty years of combined service in the valley is proud to offer our services to all homeowners in the area. We handle all types of residential roof repair and residential roofing. Tile roofing? No problem. Slate? No problem. We handle all kinds of jobs from a small roof repair due to a leak or hole to a full scale new construction or remodel. If you are thinking of getting your roof repair done and don’t know who to call, give us a call for a free estimate. Check out our testimonials from happy and satisfied clients who have trusted in us and were glad they did. We will be happy to provide references for you to call. We are a roofing company that knows how to handle every kind of residential roofing scenario. Our experience and quality workmanship continue our tradition of installing elite roofing systems. Our team of roofing contractors install all of the critical roof components to protect your home. After people buy a house or business, they may want to upgrade their structure’s roof. Choosing the best roofing material can be a challenge if they are unsure of what choices are available and what ones best suit their building’s specific needs. When they call our Phoenix roofing company, we can guide Phoenix residents in the process of upgrading or repairing their roofs. With our assistance, home and business owners in this city can enjoy knowing that their roofs are in prime condition. If people need to have their roof repaired, we can offer them several different options. Some people like to use the same material that is already on the roof. They may believe that using the same material speeds up the repair process and may be cheaper overall. However, other residents want to upgrade or choose a different material. We can suggest asphalt, tile, wood, and other materials. These choices all have different benefits and offer the convenience and safety that people prefer. Offering a variety of choices. Guiding clients in the upgrade process. Offering around the clock services for our commercial clients. Hire top rated roofing contractors in Phoenix, AZ. Your roof can be repaired or replaced by professionals, trust the experts at Arizona Roof Rescue. Homeowners often consider affordability and safety when they choose roofing materials. Asphalt is readily available and offers people a uniform appearance that they may prefer. Asphalt also proves to be affordable and can fit within most customers’ budgets. Alternatively, if they seek something more decorative and upscale, homeowners may consider tile. Tile roofing is available in a variety of colors and can add a decorative appeal to any home. When they are uncertain about how they would like their roof to look, we can provide suggestions and help them make this decision for their residential roofing project. A homeowner can, with a bit of assistance, make fundamental repairs to their home. Normally things like hanging a ceiling fan, replacing a light switch or installing a toilet are things the average homeowner can accomplish easily; however, roof repair is something that is best left to a professional roofing service. A natural disaster such as a tornado, hail storm or high wind can cause massive damage to a roof. A torrential rain could cause your roof to leak water into the home as well, and if not caught in time, the damage can quickly rise to the tens of thousands of dollars. Do not wait if you have a Phoenix roof repair issue; contact a professional quickly. A repair can range from fixing few broken shingles to repairing large holes from a disaster. A professional roofer will have the appropriate tools, knowledge and skill to repair the roof to as-new condition. Licensed, bonded and insured residential roofing companies are there to assist you. You, as a homeowner, will have no concerns or issues once you place a call for a repair. A Phoenix residential roofing contractor will come to your home, assess the damage, give you a quote for homeowner’s insurance and be ready to return to complete the work. You can be well-assured the quote will be reasonable, affordable and the construction done as rapidly as possible. It may be that the roof on your home is nearing a replacement period. The average life-span of a normal roof is about 20 years, and after that time, it is recommended the roof be stripped and re-shingled. The average homeowner will not have the time, skill, tools and equipment necessary to re-shingle a home. It is best to leave sort of work to the professional roofing company. No matter the reason, Arizona Roof Rescue is at your service with quick, friendly and professional roofing contractors. We will work diligently and quickly to make sure your roof is repaired. Roof damage is not something a home can endure for a long period. Call us as soon as you realize there is an issue; we are here to help you. Business owners also consider price, safety, and visual appeal when they think about their roofing needs. Even more, they want the peace of mind in knowing that their roofs are functional and will not threaten their companies’ livelihood. With that, we offer our commercial clients’ roofing services that help them worry less about their roofs. They can rely on us to inspect their gutters and make repairs as necessary. We are available 24-7 for our commercial customers’ convenience, allowing us to address their roofing concerns any time of the day. We also can seal flat and low-slope roofs. Call our Phoenix office today at 602-242-2706. We’re looking forward to servicing you today! Overall happy with the work!